We are proud to announce the adding of Position Changes Reports for domain queries in Organic and Advertising Research for SEMrush LIVE Database. These graphs/charts generally fall into four different categories: showing appeared keywords, disappeared keywords, keywords for which a domain improved its position and keywords for which a domain declined in position. All reports are displayed according to a daily data update. You can view information about keywords based on any of the categories listed in the dimension line by clicking on the category desired: New/Lost/Improved/Declined. Some categories also allow to sort queries from low to high and from high to low. 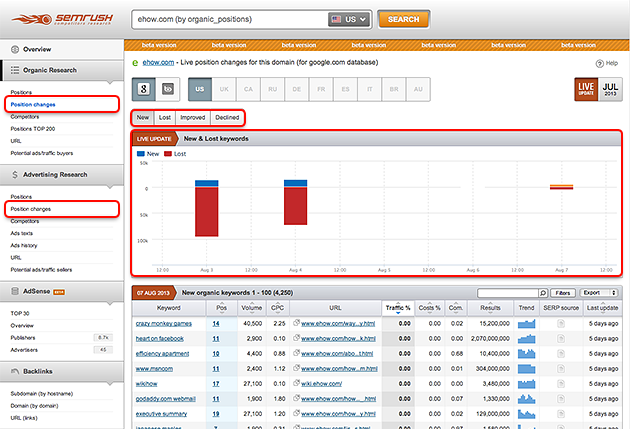 We hope this will help you to make even better use of SEMrush service.